Glasgow Life turned to IES Consulting to address issues concerning operational performance at the Riverside Museum, which is the city’s award-winning transport museum. 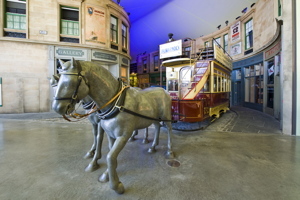 It houses over 3,000 objects – from skateboards to locomotives, paintings to prams and cars to a Stormtrooper. Located at Pointhouse Quay in the Glasgow Harbour regeneration district of the city, the building opened in June 2011, and it is currently one of Scotland’s top visitor attractions. 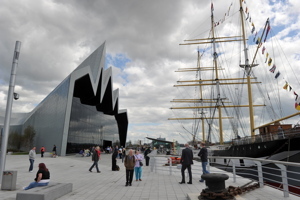 Glasgow Life, managers of the museum and other venues around the city, sought support from IES Consulting in the summer of 2016, after identifying that the Riverside Museum was performing especially poorly against other properties in its portfolio and against the organisation’s energy management KPIs. One of the challenges with the Museum is metering. As is common with many modern buildings, sub-metering had been implemented at the site without the capability to log consumption over time. This limited the usefulness of sub-metering as a tool to identify where energy was being consumed, detect faults or determine where energy saving measures could be implemented to greatest effect. Following discussion with IES, Glasgow Life commissioned their controls contractors to enable communications between the existing sub-meters on site and their Andover Continuum building management system. IES liaised with Glasgow Life to set up a data acquisition framework, allowing BMS and submeter data to be transferred from the BMS onto the IESSCAN platform. IES then began to analyse the data. By June 2017, the team had developed a clear understanding of energy use patterns at the museum, including seasonal variations. Robert McQueen, energy conservation officer at Glasgow Life says: “Having the submetering data collected and recorded with the BMS System has allowed baseline consumption levels to be captured and enabled us to easily monitor and identify any plant maintenance issues that cause increased energy consumption. Initial investigation of the data brought to light a number of major energy users in and around the building. The HVAC system accounted for the majority of electrical energy consumption on site. The air handling units (AHUs) serving the main exhibition space were a major factor in this, accounting for 36.5% of total electricity use, and the chillers accounted for a further 10.8%. The Tall Ship, Glenlee – one of only five Clyde-built ships still afloat in the world today, and which serves as a museum in its own right - was also identified as drawing 10.8% of total electricity. Measures advised by IES included rectifying the inconsistencies in chiller operation, realigning set points, and fixing problems with the AHUs including unnecessary overnight operation. Many of these operational issues are likely to have persisted at the Museum since opening and highlight the importance of rigorous building handover processes and commissioning. Isabel Brown, head of infrastructure support at Glasgow Life, says: “The comprehensive information that sits behind this data collection and analysis project has been invaluable. By identifying where the operational issues lie, we have been able to adopt a much more focused approach to consider the environmental condition requirements of the museum and understand where we can adjust bandwidths to save energy and costs. The project also identified pieces of plant equipment that were not working properly, allowing us to work more effectively with our maintenance contractors to resolve issues. IES was able to achieve significant energy savings in both gas (26%) and electricity (18%) at the Museum. The savings in gas energy were validated using a Measurement and Verification (M&V) technique to ensure that the savings were not due to difference in weather conditions. Equating to £52.3k savings over the project year and IES plans to continue working with Glasgow Life to ensure these savings are not lost through ‘operational drift’ over time. Brown adds: “Possessing such complete and tangible information about the operation of the building has given us a clear understanding of how the building actually operates versus how it was predicted to operate at design stage. For example, actual visitor numbers significantly exceeded the expected visitor numbers, which led to the doors malfunctioning and being open for during opening hours, which caused issues with conditioning the space. As part of continued efforts to improve energy performance across the portfolio, IES are continuing to work with Glasgow Life on three leisure centres, whilst providing ongoing monitoring and analysis of the Riverside Museum.